Do you want an Italian car that sounds as gnarly as a Ferrari but you can park at Trader Joes? Enter the Fiat 500 Abarth. What do you need to know before you buy a Fiat 500 Abarth? Don’t worry, we’ll tell you everything right here in the Ultimate Buyer’s Guide. The Fiat 500 was the Italian company’s return to America timed nicely with their merger with Chrysler. The little car was a hit, offering a lot of what you could get with a Mini Cooper but with more Italian flare and a lower price. What enthusiasts wanted, though, was the punky Abarth version. With 160 horsepower and 170 lb-ft of torque it’s not the car in this class with the most power, but it is the smallest and that counts for a lot. It’s stupid fun and it’s affordable and it’s loud. Oh so loud. Fun fact about the Fiat 500 Abarth: It doesn’t need a muffler so it doesn’t have one. That means the tiny 1.4-liter turbo four sounds better than anything this side of a $70,000 sports car. We once were driving one in New York and got two guys in a Lamborghini Gallardo Sypder to turn their heads when we revved. Does it have the bite to match its bark? Mostly. If the Fiesta ST is a scalpel the Abarth is a child-sized chainsaw. You can definitely take it to a track and put down times as you lean it into and out of each turn, but the Abarth is more fun in big open parking lots where you can toss it with abandon. It’s quick but not fast, offering punchy acceleration when you downshift but eventually running out of steam when you get up to the kinds of higher speeds where you’re going to want something a little bigger. The gearbox isn’t a favorite amongst journalists because of its long, notchy throws – it feels more economy than sport. The interior isn’t fantastic for the price and you still feel like you’re sitting on a toilet when you’re driving it. Who cares? If you’re buying an Abarth you’re buying the car because it’s loud and ridiculous and fun. Short wheelbase + spinning front wheels + lots of power = good times. The Fiat 500 Abarth has been putting around Europe since 2008, while we here in the U.S. have been watching Jeremy Clarkson rave about it on Top Gear, wishing for our own. But in 2011, our dreams came true at the Los Angeles Auto Show, as Fiat introduced the 2012 500 Abarth for North America. A year later brought the 500C Abarth cabrio, and 2015 brought along a six-speed automatic transmission. There’s not much new for ‘16: just some new paint options and the new Uconnect 5.0 in-car communication system makes its appearance. Unlike the other FCA products that uses the 1.4-liter turbo engine (ahem, Dodge Dart, Jeep Renegade), the Abarth’s powertrain feels very well matched to the chassis and downright peppy. Power numbers aren’t huge , but considering its feather-like curb weight, 160 horsepower and 170 lb-ft goes a long way. Sure, zero to 60 in seven seconds isn’t lightning speed, but combined with the noise and the car’s “tossable” size, it’s a hoot. Fuel economy is good, which should come as no surprise, as this car only weights about 2,500 pounds. Even though it’s down a gear to the Fiesta ST, the manual five-speed Abarth scores an impressive 31 MPG combined, two more than the 197 horsepower Fiesta ST. The automatic 500 Abarth sacrifices a whopping 4 MPG combined, so you can probably guess which one we’d buy. 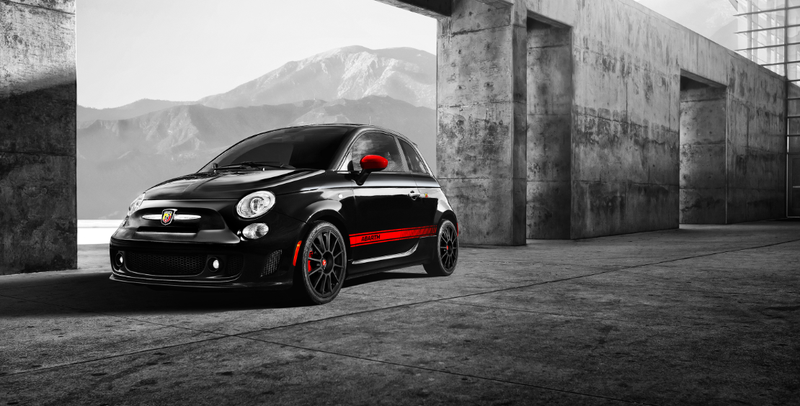 The 500 Abarth comes in two trims: base Abarth and Abarth Cabrio (500C). All Abarths come with a MacPherson strut front suspension design and a rear twist beam setup. Brakes are 11.1-inch vented rotors up front and 9.4-inch solid discs out back. All four brake calipers are single-piston. Abarth Cabrio: Starts at $26,595. Notable standard features over Abarth: power-folding cloth top, rear park assist system. Same options as base Abarth.